For travelers as the site rent season does not provide another form of consultation, I would like to clarify that our rental is per day so you should calculate the amount of $ 45.00 per day and in the end of the week would be $ 45.00 X 2 = R $ 90.00 per person, also remembering that the rule of our rental is at least 40 people so the minimum rental for the weekend starts from R $ 3,600.00, remembering that these values may being altered due to the spaces we want to rent, we have several spaces such as places for outdoor wedding and religious temple, and others that we personally negotiate. Because each lease has its particularity and are charged according to each negotiation. Never close before contacting the owner directly, the locations with the site will be disregarded by the owner, and we will not be responsible for returns of the amounts paid to the site rental website. Site with more than 10 thousand square meters of floor area, located 74km from Sao Paulo, Beautiful scenery and tranquility. Swimming pool 10 x 20m, games room, sports court, soccer field, playground, barbecue, 12 chalets, accommodation for up to 190 people per overnight stay, camping area, party room, religious temple, changing rooms, Woods. amamos tudo muito bom bem conservado e com uma estrutura impecável, é um local realmente que nos traz paz . 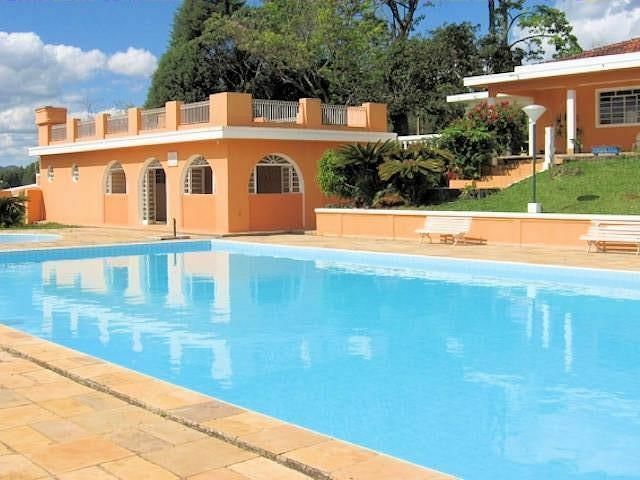 Located 74km from Sao Paulo, access to Santa Isabel Presidente Dutra highway. It is 10km from the center of Santa Isabel and 5km from the center of Igaratá.